The following overview provides you with information on all security bulletins and updates that Microsoft released in August 2016. Microsoft releases security patches on the second Tuesday of each month. This month, the updates were released on August 9, 2016. The overview begins with an executive summary listing the most important information. It is followed by the operating system distribution, and information about patches for other Microsoft products. What follows is a list of all security bulletins, security advisories and non-security patches that Microsoft released this month. The final part offers download instructions, and links to various resources for further information. Microsoft published a total of 9 security bulletins in August 2016. 5 of the bulletins received an aggregate severity rating of critical, the remaining ones the second-highest rating of important. Affected products include all client and server Windows operating systems, Microsoft Office, Internet Explorer, Microsoft Edge, and Skype for Business 2016. All client and server operating systems are affected by at least one bulletin rated critically for the system. Windows 10 is affected by the most bulletins. This can be explained by the cumulative Microsoft Edge bulletin MS10-096 and the Windows PDF Library bulletin MS10-102. Windows 8.x is also affected by the latter but not by the former. Windows 10 is furthermore affected by MS16-103 rated important, while all other client operating systems are not. The situation looks identical on the server side of things. This security update resolves vulnerabilities in Microsoft Windows, Microsoft Office, Skype for Business, and Microsoft Lync. The most severe of the vulnerabilities could allow remote code execution. This security update resolves a vulnerability in Microsoft Windows. The vulnerability could allow security feature bypass if an attacker installs a policy affected by the vulnerability onto a target device. This security update resolves multiple vulnerabilities in Microsoft Windows. The vulnerabilities could allow elevation of privilege if an attacker runs a specially crafted application on a domain-joined system. This security update resolves a vulnerability in Microsoft Windows. The vulnerability could allow remote code execution if a user views specially crafted PDF content online or opens a specially crafted PDF document. This security update resolves a vulnerability in Microsoft Windows. The vulnerability could allow information disclosure when Universal Outlook fails to establish a secure connection. Microsoft is blacklisting some publicly released versions of securekernel.exe. Lots of fixes, includes the security updates. All information on this page. Update that includes a number of fixes and improvements. This includes Edge extension and background task improvement among other things. All changes are listed on this page. Update for Windows Journal component removal. This update lets users remove the Windows Journal component immediately. Users who require Windows Journal can install it as a standalone application by going here. This update introduces a wide variety of updates (mostly fixes to existing issues). You find the all listed on this page. July 2016 update rollup for Windows Server 2012. The update fixes several issues and makes improvements to supported operating systems. The full list is accessible here. All security updates are made available on Windows Update. Windows home devices are configured by default to use Windows Update. Depending on the configuration, updates may be downloaded and installed automatically. Tap on the Windows-key on the computer keyboard, type Windows Update, and hit enter. This should open the Windows Update dialog. Windows may run a check for updates automatically, or after you click on the "check for updates" button or link. 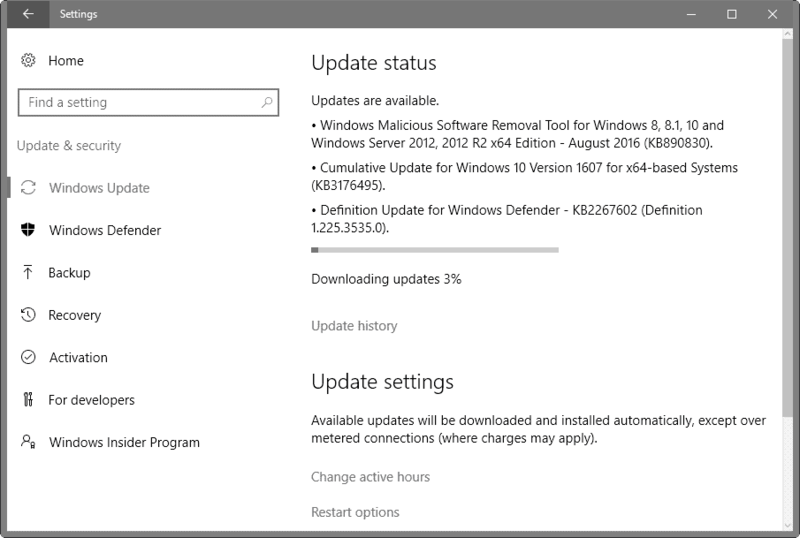 Updates that are found are either downloaded and installed automatically, or on user request. It is recommended to research all Windows updates before installing them on productive machines. The reason for this is that updates may break functionality or in the worst case prevent the system from booting at all. It is recommended to create a system backup prior to installing updates as well. Updates are also provided via Microsoft's Download Center, monthly Security ISO image releases, and via Microsoft's Update Catalog. Same can be said about Apple, Google and Security. Nice to see Microsoft dashing hopes that the end of the free upgrade period for Windows 10 would see an end to the Get Windows 10 app, anyone know what this new update to it does now? My guess is that KB3035583 hasn’t really changed, they’re just marking it as “new” in order to remind everyone who hasn’t yet upgraded that they can. Or in my case, that I can continue to run Win 7 and ignore them. @ Corky ……. Those who apply the GWX KB3035583 update n upgrade to Win 10 thinking it is still free, may find that it cannot be activated = may need to pay M$ US$119 or $199 for a Win 10 Product Key. Another trick up M$’s sleeves.? OTOH, Win 7/8.1 non-Ent users can still upgrade to Win 10 for free by just claiming to be using assistive technology(=disabled) n go to the relevant M$ website to do the free upgrade. …….There is always the risk of the upgrade failing n bricking the cptr. Those affected r required to call M$ for a solution, ie likely can’t use the Media Creation Tool on their own. the period ain’t over completely. turn on narrator or magnifier, check a mark that you use the stuff and you still get a free license. Microsoft Bing account (access to search history)..